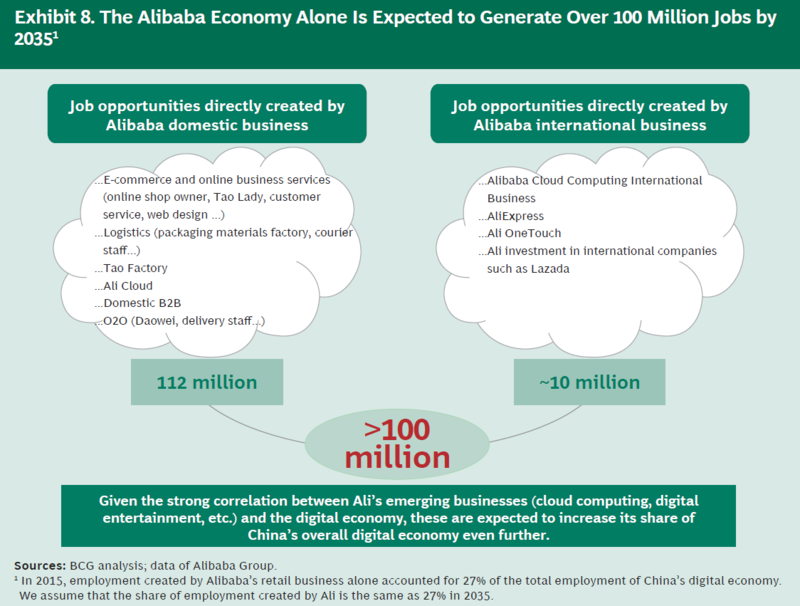 In 2035, the “Alibaba economy” could generate about 30 percent of all the jobs available in China’s digital economy, according to a new report from management advisory firm Boston Consulting Group. 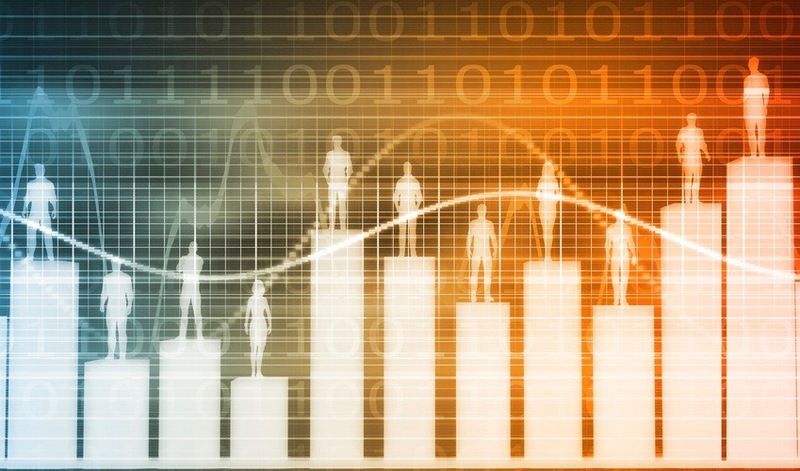 The just-released study, “Year 2035: 400 Million Job Opportunities in the Digital Age,” said the e-commerce giant, which has expanded into cloud computing, financial technology and media and entertainment, could account for as many as 122 million of the 415 million total jobs available in China’s digital economy, or 29.4 percent. According to a 2016 study by Renmin University in Beijing, Alibaba’s e-commerce platform alone has already created 31 million jobs, BCG wrote. That figure includes not only the staff employed by Alibaba, of course, which accounts for only a small fraction of the total. Most of the jobs have come through the creation of new online businesses using Alibaba’s platform as e-commerce rose in prominence over the past 17 years, and through ancillary businesses that grew up around it, such as logistics. 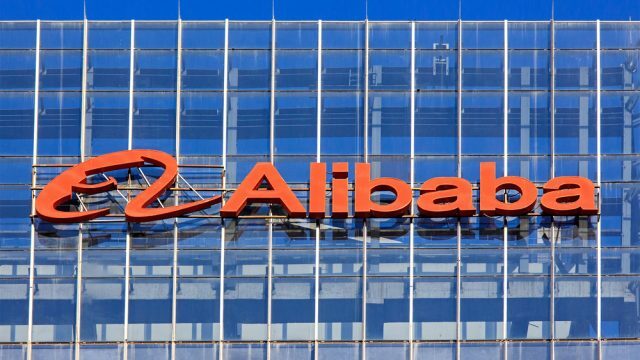 The report noted some specific areas where Alibaba had created jobs in addition to its regular focus on opportunities for consumption in China. About 15,000 “Tao Factories” have sprung up, offering merchants selling on Taobao access to smaller-quantity manufacturing, as well as over 1,300 “Taobao Villages,” which are centers of e-commerce in the rural countryside. At the same time, the IT infrastructure provided by Alibaba Cloud has generated 1.2 million jobs at Chinese startups, BCG wrote. In its “Year 2035” study, BCG looked at the larger impact that technology would have on employment and talent over the coming two decades, estimating that China’s digital economy would make up 48 percent of the country’s total economy in 2035, accounting for $16 trillion in spending. In 2015, those numbers were 13 percent and $1.4 trillion respectively, and just over 100 million jobs. 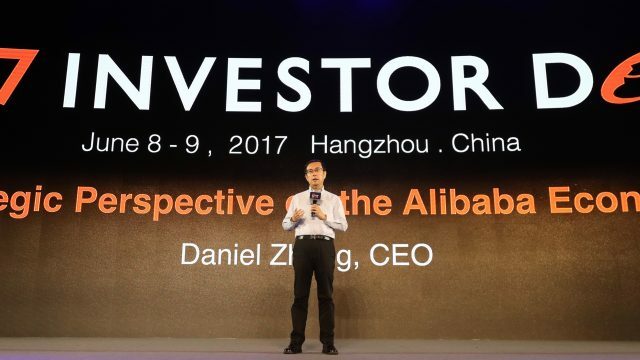 A number of trends are expected to drive the growth, including seismic changes to the retail, finance and manufacturing industries, which are already being targeted as opportunities by Alibaba. Similarly, “New Finance” is the use of the internet, the cloud and data to deliver services that make consumers’ lives easier. 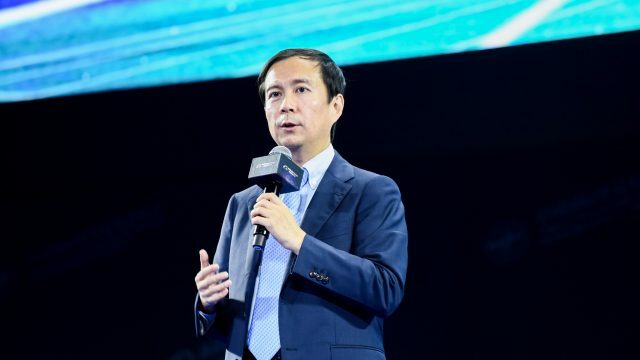 For example, Alipay, the financial technology platform of Alibaba affiliate company Ant Financial, has grown from an online-payments hub to one that includes “routine tasks, social life and services for 450 million users,” according to BCG. In addition to leveraging technology to add efficiencies to the production process, “New Manufacturing” anticipates the use of near real-time consumer data to help make manufacturers more nimble and responsive to purchasing trends, even shifting the flow of product creation from businesses to consumers (B2C), to consumers to businesses (C2B). Already some Chinese companies “are customizing product design and then producing on a large scale according to individual demand,” BCG wrote in its report. BCG said that entertainment would be an additional growth area for China’s digital economy, as companies such as Alibaba expand their market footprints to include everything from music to games to television and movies. The rise of Chinese cyber celebrities and other user-generated content, along with the integration of entertainment-based consumer data for business decision-making will play a role as well. Alibaba Pictures’ ticketing app, Tao Piao Piao, is already aggregating information collected from Alibaba Group’s vast ecosystem of businesses to predict movie sales and personalize the app’s user experience for moviegoers. BCG said that as all industries go digital, most jobs will require an increased level of technical know-how. Marketing, for example, is shifting to digital marketing, while business analysis is changing to big data analytics. Therefore, workers with these skills and other competencies not easily replaced by technology “will enjoy a wider career path and advantages in reaching the top, and will gain the most attention in the war for talent,” BCG said.